By failing to return an overall majority, the UK General Election has descended into farce. Hardly a surprise when you consider the campaign that went before. 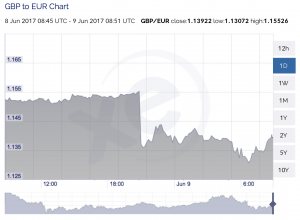 Investors and currency traders wasted no time reacting to the news, crushing the Pound as punishment for British indecision. But this confusion is great news for businesses based outside the UK. The weak Pound means that you can now get a lot more copy for your money. In fact, my copywriting prices are now 2% cheaper than they were yesterday. Or 13% cheaper than this time last year. Now is the time to invest in a native English copywriter to produce content for your international audience. Not only do you get the highest quality copy, but you pay less than ever before. Businesses like Panda Security (Spain), Computer Data Source (USA), Falcon Social (Denmark), Boss Digital (Hong Kong) and Recently (Moldova) are already benefiting from the weak Pound (and my copywriting services). Drop me a line and let’s see how much you could save by hiring a native English copywriter.